In this work a decorated combat veteran, plus bestselling author, turns his sights on the true focal point of the Vietnam War. He unveils a chronicle of unsung U.S. courage in battle, while also acknowledging that the second the U.S. decided to give up on its fight for the A Shau Valley it was clear that the war had been lost . . .
Finalist, 2016 Army Historical Society Distinguished Writing Award. Throughout the Vietnam War, one focal point persisted where the Viet Cong guerrillas and ARVN were not a major factor, but where the trained professionals of the North Vietnamese and U.S. armies repeatedly fought head-to-head. A Shau Valor is a thoroughly documented study of nine years of American combat operations encompassing the crucial frontier valley and a 15-mile radius around it—the most deadly killing ground of the entire Vietnam War. The various campaigns included Operation Pirous in 1967, 1968’s Operations Delaware and Somerset Plain, 1969’s Operations Dewey Canyon, Massachusetts Striker, and Apache Snow—which included the infamous battle for Hamburger Hill—culminating with Operation Texas Star and the vicious fight for and humiliating evacuation of Fire Support Base Ripcord in the summer of 1970, the last major U.S. battle of the war. By 1971 the fighting had once again shifted to the realm of small Special Forces reconnaissance teams assigned to the ultra-secret Studies and Observations Group—SOG. Other works have focused on individual battles or units, but A Shau Valor is the first to study the nine-year campaign—for all its courage and sacrifice—chronologically and within the context of other historical, political and cultural events. Colonel Thomas R. Yarborough served as an Air Force pilot for 28 years and flew two combat tours in Vietnam as a forward air controller. His combat decorations include the Silver Star, Distinguished Flying Cross, Purple Heart, Air Medal, and the Vietnamese Gallantry Cross with Bronze Star. A former professor and department chair at Indiana University, he now lives in West Springfield, Virginia, where he maintains ties to the academic community by writing articles for various scholarly journals and periodicals. He is the author of the critically acclaimed book, Da Nang Diary. Colonel Thomas Yarborough spent his time in the air over the A Shau Valley, but he has detailed knowledge of what took place on the ground. He insightfully covers the infantryman's hardships, difficulties, and physical price paid. Thanks to his extensive research, study, and personal knowledge,Tom describes the nine-year war in the A Shau in riveting detail. This book is a "must read" for all interested in why we did not close and win that war. - Wesley L. Fox, Colonel USMC (Ret), Medal of Honor recipient and author of Marine Rifleman: Forty-Three Years in the Corps. 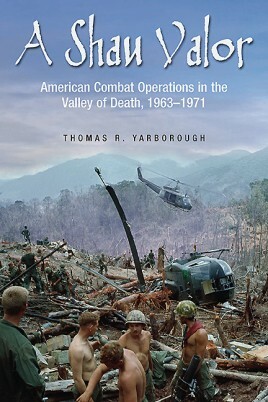 "Tom Yarborough provides a gripping, fast paced, page-turning account of America's finest warriors who fought in and above the most strategically important terrain in Vietnam. A masterful blend of history, national strategy, and warrior ethos which simultaneously highlights leadership attributes at every level. A must read for all warriors, scholars, and students of leadership. Additionally, it is a great tribute to the warriors who fought, and those who died, in the A Shau Valley." "There is such a great deal we still don't know about some of the theaters of the Vietnam War - Yarborough writes as though he were there when it happened, such is the vividness with which he recounts some of the events..."
"...while much of this ground has been covered before in many books, this is the first volume that looks solely at fighting in the A Shau during virtually the entire Vietnam War. It is a worthy endeavor." "... arguably the first full length account of American combat in the valley, stands as a sterling testament to the extraordinary courage- no less than 15 Medals of Honor were awarded for actions in and around the valley- displayed by the men who fought and died there." Applying the lessons of the A Shau to today’s conflicts one can also ask if its mistakes are being repeated today." "The North Vietnamese Army and the US Army clashed frequently in this strategic valley near the Ho Chi Min trail. The author covers the nine years of fighting that occurred there." "This is a truly remarkable, well-written, thought-provoking book...will appeal to a wide audience interested in gaining a better understanding of the Vietnam War"
"Yarborough's work is replete with repeated references to the valor of those who served in this hotly-contested section of Vietnam... Highly recommended for those interested in this important part of the War in Vietnam."